Every so often, on rare and memorable occasions, life hands out perfect days. These are days to savor, days that leave an imprint on our souls. I experienced the gift of one such day recently. A number of years ago, two dear friends and I hatched up a Mothers’ Day plan while pushing baby joggers up steep Vermont hills on our ritual morning walk. What better way to celebrate motherhood, we posited, than by escaping responsibility for a day? So we ran away to Montreal for Mothers’ Day weekend, returning for Sunday’s bounty of cards and hugs and food cooked by hands other than our own. When I left the Vermont hills for Midwestern cornfields, I brought the tradition with me and have sporadically lassoed various friends into my annual escape. This year, Mothers’ Day Saturday dawned brilliantly sunny and pleasantly warm. Four of us passed the two-hour drive to St. Louis switching comfortably between the trivial and the profound with ease born of long friendship and shared experience. We stopped first at the St. Louis Art Museum (SLAM), drawn by the traveling exhibit: Impressionist France. Through the lens of Charles Marville and the brushes of Claude Monet, Jean-Francois Millet, Edouard Manet and their compatriots, we toured Paris and the French countryside, 19th century factories and the coastline. 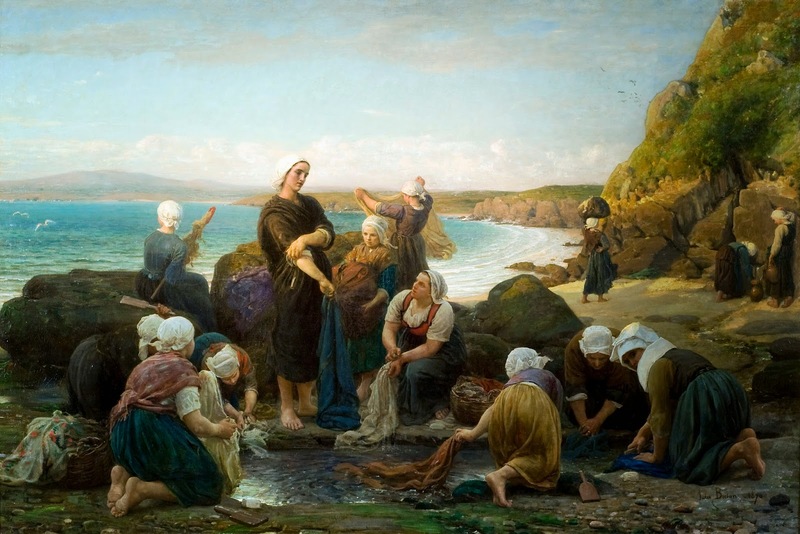 The washerwomen of Jules Breton struck a particular chord, goddesses in bare feet and white caps. Leaving the stately columns of SLAM, we headed to 39th Street and Sweet Art, a neighborhood café, bakeshop and art studio owned by baker Reine Bayoc and her artist husband Cbabi Bayoc. While indulging in vegan eats and not quite so vegan but oh so amazing pastries, we discovered Cbabi’s “365 Days with Dad,” a project of 365 paintings celebrating black fatherhood. His paintings are worlds apart from Jules Breton but equally powerful in their own sphere. Still munching vegan brownies, salted caramel bars and hummingbird cake, we made our way downtown to a fantastic production of Joseph and the Amazing Technicolor Dreamcoat. Joseph and his brothers delivered, as did the opulent Fox Theater. Once back in the sunshine, we wandered for a time, drunk on summery air and the wonder of a few hours without schedules and demands. We stopped first at St. Francis Xavier College Church, pausing to meditate in the hush of intricate stained glass and worshippers waiting for their turn at confession. Around the corner, on the campus of Saint Louis University, we found a delightful collection of sculptures, a perfect picnic spot tucked among perennials, and a couple of stately stone lions watching over the Moolah Temple. We rounded out our adventure under the tutelage of Mai Truong, the chatty founder of the OR Smoothie & Café in the Central West End. Sipping power smoothies and munching Vietnamese spring rolls, we reflected on a glorious day in the middle of lives that, for all of their twists and turns, have treated us remarkably well. My grandfather loved the song "A Perfect Day," by Carrie Jacobs-Bond. "When you come to the end of a perfect day," she wrote, "and you sit alone with your thought, ...mem'ry has painted this perfect day with colors that never fade, and we find at the end of a perfect day the soul of a friend we've made." Ms. Jacobs-Bond wrote those lyrics 100 years ago after watching a magnificent sunset at the close of a glorious day spent motoring with friends. I think perhaps I know just what she was thinking that evening.